D Series products are user controls, indicators and connection plates that are compatible with Decora® style mounting. 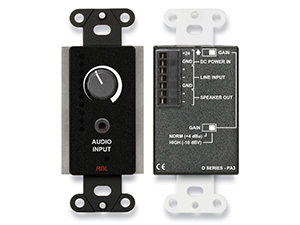 D Series modules and jacks connect directly to a variety of active RDL modules in multiple product series and are compatible with many OEM products. Products in this series may be active or passive. All D Series front panels are constructed of stainless or carbon steel for durability, shielding and static protection. Stainless steel models feature a brushed finish with direct lettering. Painted models are finished with a reverse-printed front-panel polycarbonate laminate which provides an attractive, durable finished appearance. Connector plates offer pass-thru jacks or rear-panel solder terminals. Transformer-isolated connector modules are equipped with a shielded enclosure and a rear-panel terminal block. Active models include remote controls to provide source selection, routing, level control, muting, source or level LED indication and more. The depth of D Series products is sufficiently shallow to permit mounting not only in standard North American electrical boxes but also in RDL wall boxes designed to fit in narrow walls used in international installations. 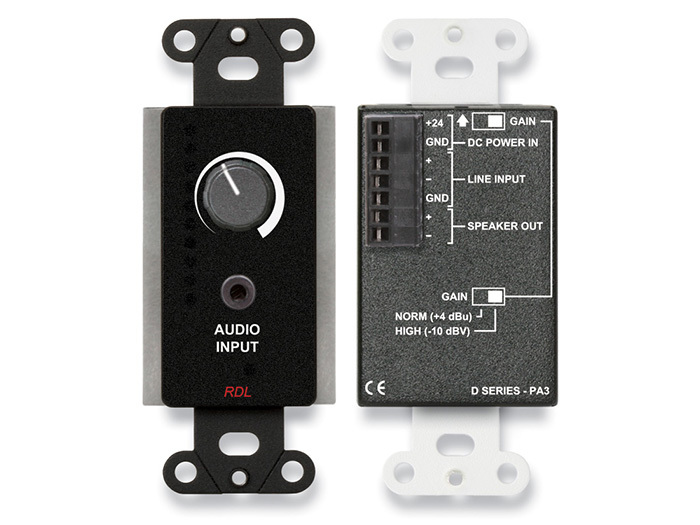 RDL also offers a variety of related accessories for wall mounting, surface mounting and desktop chassis mounting of D Series products, as well as matching metal trim plates. Attractive styling, ease of installation, long-life pushbuttons, high quality connectors and worldwide mounting possibilities make D Series products a preferred long-term resource for system design solutions. D-SERIES modules are designed and manufactured in the U.S.A.